Today I wanted to talk about a DIY project that we are contemplating taking on. It all started with some amazing chairs that we actually found in the clearance section for only $50 each. They had some pretty dingy linen fabric and were a bit scratched in the back, but it was nothing a good cleaning couldn't fix. Truthfully I don't mind when things are a bit marked up, especially when they originally went for $499 each and we only paid $50, what a steal! Whenever we posted furniture pieces to sell from the makeover and the chairs happened to be in the background I always had people ask me about them. I decided a long time ago that they are keepers, but we're going to give them a bit of a face lift.With a nice white coat of paint and some new upholstery these babies can go from good to great. 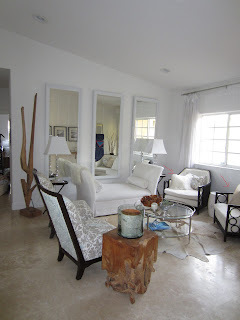 The dilemma is if we want to pay the $150 ea that we were quoted to paint them white lacquer professionally or if we want to take on this task ourselves in addition to the $150 ea that I will have to pay to reupholster them. Though it seems like a no brainer, we have sooooo many other projects that I really fear it may never happen! Above is the Williamsburg FINNIE FLAMESTITC PLATINUM, it is $22/yd and is my #1 favorite. 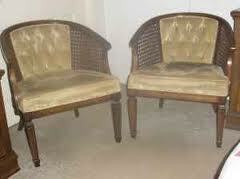 It has a very vintage feel to it with grey and ivory colors. I have such a crush on this pattern. 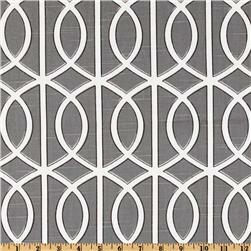 This is the Dwell Studio Bella Porte Charcoal for $16.98/yd and would be a nice modern print if I wanted to go that direction. 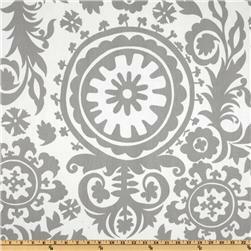 This is the Premier Prints Twill Suzani Storm Grey and is my favorite #2 choice. I love that the print is a bod quirky and out there with nice grey colors. It is only $7.98/yd but is not available until 12/4/11 which just won't work for me LOL. 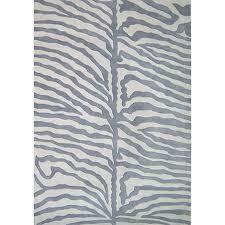 My last choice and very close favorite is a light grey and cream zebra print. With this unexpected shade of grey and the modern zebra print, I'm obsessed!!! I can't find a good one anywhere so no price for you on this one, but today I'm off to a fabric store so let's see what I find. 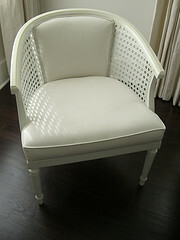 Here is a chair that was transformed that I think is similar at least in color to my beauty. So what do you think? Should we just bite the bullet and have these babies painted or try to take the project on ourselves? Please share a link or tell us your experience if you've done something similar and how that went for you.